Continuing with the theme of tools from the Stanley Model Shop, here’s one of my favorites. This plane was designed and patented by Charles Miller. Not a lot is known about Charles Miller, but Don Bosse of Oakdale, Minnesota, has been researching Mr. Miller and his tools for years and has promised to put all that information together sometime soon and enlighten us all! 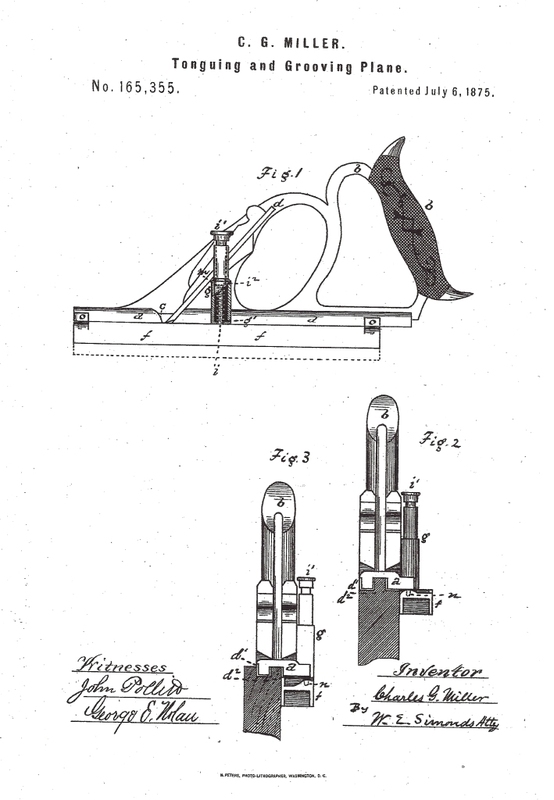 We do know that Miller was born in Brattleboro, Vermont, in 1826, came to New Britain, Connecticut when Stanley purchased the patent for his “Miller’s Patent Adjustable Plow Plane” (Patent #104, 753, issued June 28th, 1870) and simultaneously convinced Mr. Miller to join the company. 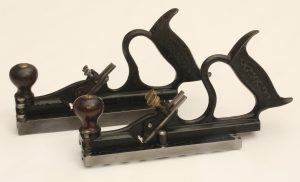 It appears he left Stanley’s employ in 1876, but in those few short years the woodworking planes he designed and more significantly, his elegant sense of design left an indelible mark on the Stanley Rule & Level Company. This plane was designed and patented by Charles Miller, but never made it into production. It’s a tonguing and grooving plane which is both elegant in its design and mechanically clever. But I’m getting ahead of myself. Miller had patented two earlier versions of tonguing and grooving planes. The picture below shows the first one. The body of the plane with its arched double cutter was designed as a single plane which would allow the user to cut either a tongue or groove without having to adjust the cutter. What’s most impressive about this plane are the design features from the elegant “swan’s neck” that joins beautifully with the toe of the plane, to the intricate scroll work on the plane’s sides, to the rear handle which became one of Charles Miller’s design signatures; this plane just begs to be held, used, and admired. 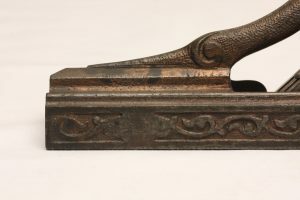 This one has the number “12” stamped on the toe of the plane suggesting it was the twelfth one made in the casting run. Despite the fact that the plane looks as if it would have performed well, there must not have been too many made as only two examples are known to exist. Neither of the two known examples has the knob shown in the patent drawing attached to the side of the plane, but both examples have the spot for the knob outlined on the casting. 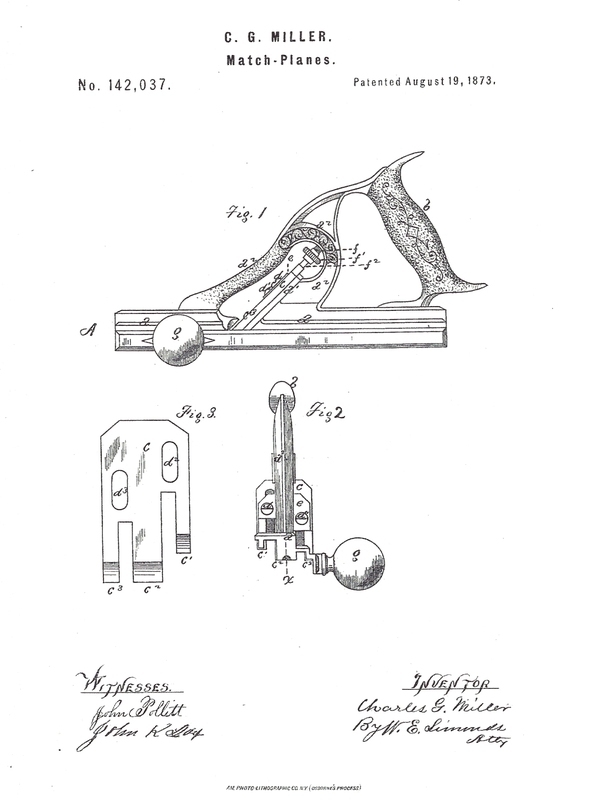 Miller’s second patent for “An Improvement in Tonguing and Grooving Planes” was Patent #165,355 granted on July 6th, 1875. 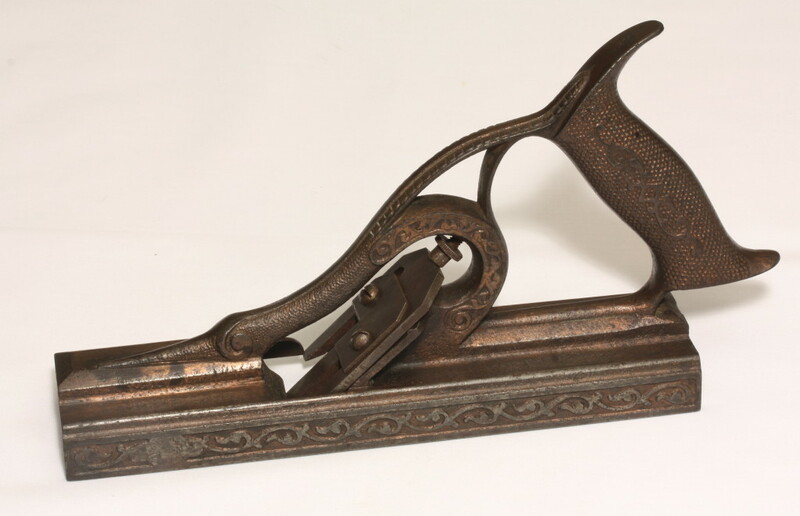 Miller described this plane as…”a device which is, at pleasure, a plane for tonguing the edges of boards, or a plane for grooving the edges of boards to receive such tongues. It is a tool for use in making what is known to carpenters as “matched stuff”…”. 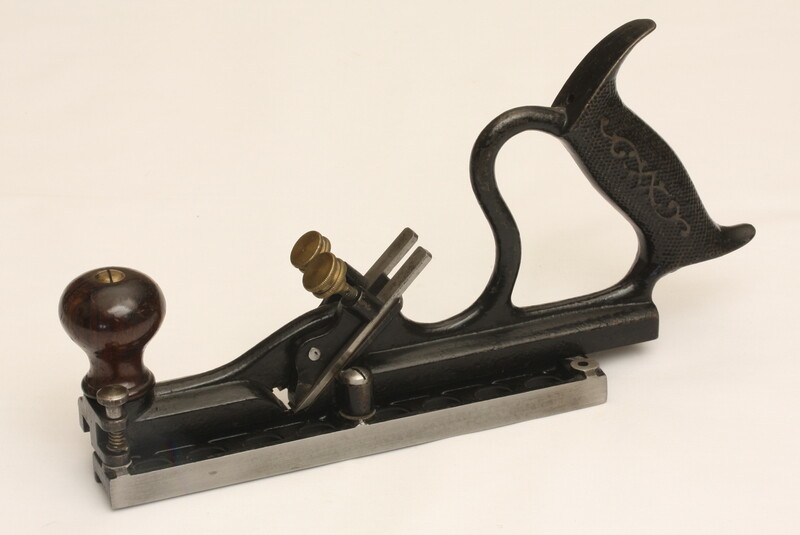 The significant mechanical difference between this plane and the previous version was the incorporation of a spring-loaded “shifting guide” attached to a swinging fence which rotated set up the two cutters to cut either a tongue or a groove. The patent drawing incorporates the classic Charles Miller rear handle attached to a curved, flowing plane body with the “shifting guide” located near the center of the plane. And now finally, we return to the last version of Miller’s tonguing and grooving plane, the one that managed to escape from the Stanley Model Shop. 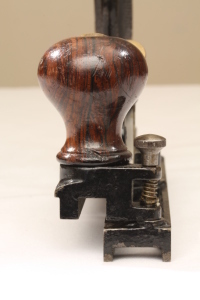 It is 10 and 3/8 inches long from the base of the rosewood rear tote to the toe of the plane. It has the heavy knurled brass knobs to secure the cutters identical to those seen on the early versions of the Stanley #48. 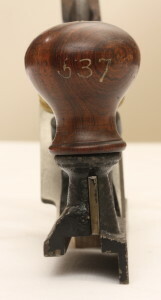 It has the Model Shop number 537 painted on the front knob and on the top of the rear tote. 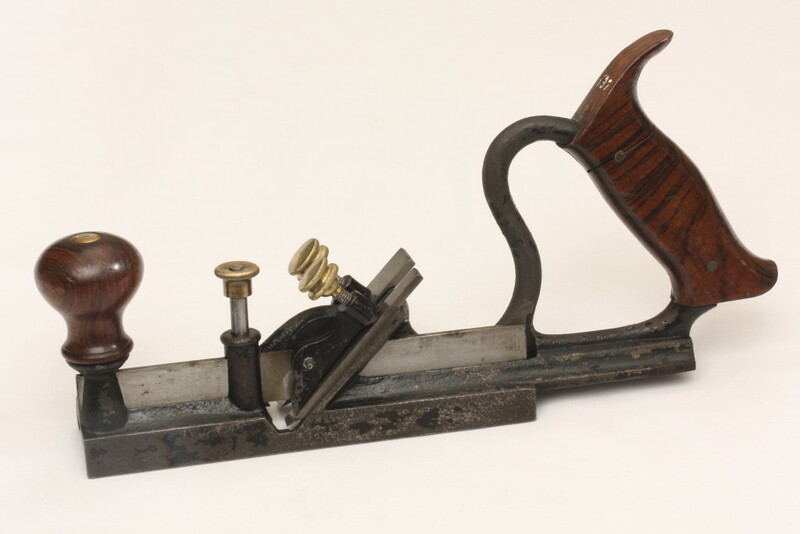 This plane is identical to the one illustrated in the patent drawing except that it has a rosewood front knob instead of the dimpled metal front knob shown in the drawings and the classic Miller metal rear handle has been replaced by a wooden rosewood handle. 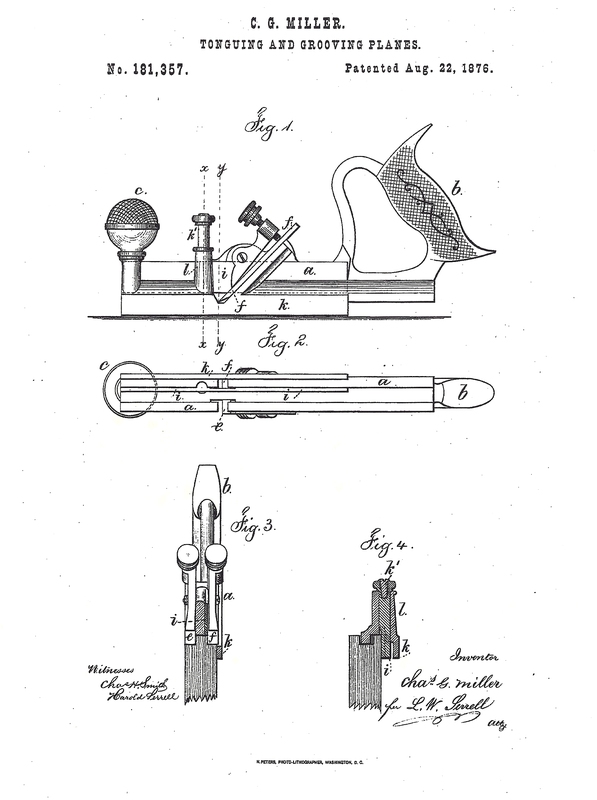 Miller was granted Patent #181,357 for this version of a tonguing and grooving plane on August 22, 1876. This plane has a stationary guide and a secondary vertically moveable guide running parallel to the stationary guide. When the plane is being used to cut a tongue, the secondary guide is pulled up out-of-the-way by lifting the brass-headed shaft and the stationary guide moves along the side of the board as the tongue is cut. When the user wants to cut a groove, the brass-headed shaft is lowered and the vertically moveable secondary guide drops down between the two cutters. The plane is then run along the side of the board with the moveable cutter as the guide, resulting in a groove being cut in the board. It’s a clever and simple mechanism assembled in a beautifully machined piece of cast iron. When I gently tried it out on a piece of soft wood, it worked very well. But, alas, this version of Miller’s tongue and groove plane never made it into production. The Stanley #48 was probably less expensive to make in that it required less machining, it worked well, and was selling well. So, this delightful plane went back into the Model Shop and in 2005 became one of the favorite tools in my collection. 1. 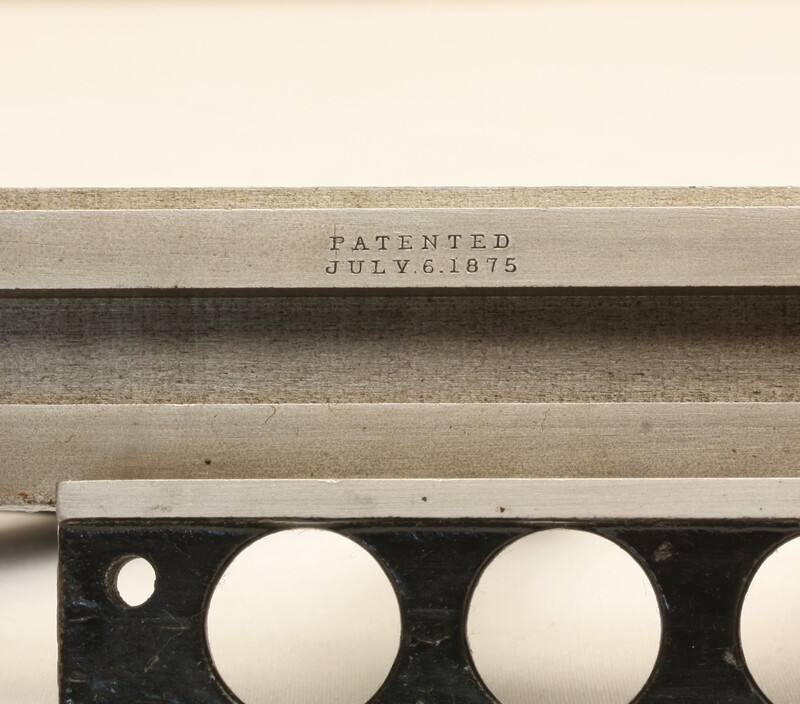 In the 1870’s, Russell & Erwin was using a casting technique patented by a Michael Smith (Patent #70,038, issued 10/22/1867) which combined casting molten metal under high pressure with the use of fine clay fired as pottery. This allowed Russel & Erwin to produce finely detailed castings for hardware. 2. 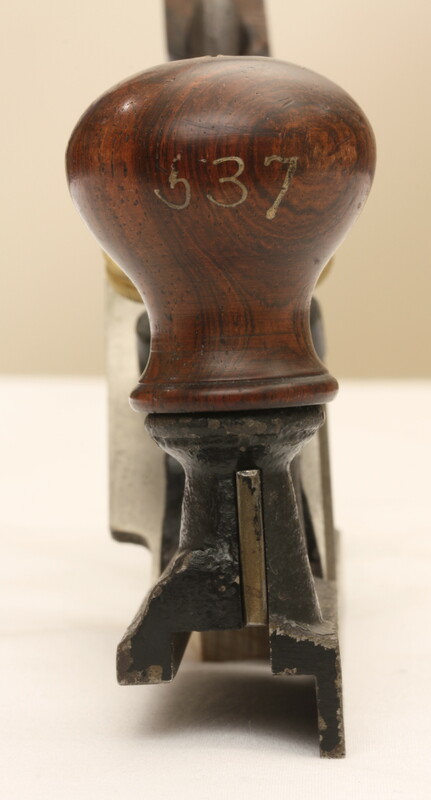 The Stanley #48 and #49 were initially made with a japanned finish with the classic Miller rear handle. 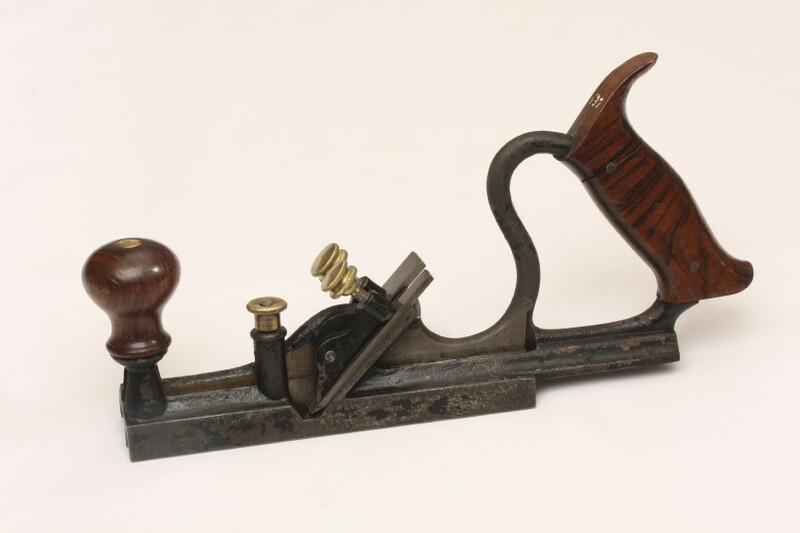 In 1898, Stanley changed the finish to nickel plating with a “fish scale” pattern on the rear handle. They are 10 inches long from the base of the rear handle to the toe of the plane. ← Time is Passing! Get Ready for Quebec City – Get Your Passport or Passport Card! Well I found two dorns patents. I have numerous PIC’s if interested, but will need an email address. If you email John Verrill at the address below he can likely post them up in a reply to this thread. Or if you already have them online somewhere you can use the ‘img’ tag in the comment editor to directly reference them or post a hyperlink to the photos. I have a few shop models and was hoping that there was a linear sequence to the numbers that were painted on them. This one threw that idea out the window. I guess I’m back to the “let’s get this shop organized” theory of the model shop painting numbers on years later? I have a #48 Stanley Tongue and Groove plane but am having trouble dating it. The finish is japanned, so the text above would make it pre-1898. It has the date July 6 1875 cast into the body of the plane just behind the pivot screw for the fence. There are no other marking on the plane that I can find. Can anyone provide more definitive information regarding the year of manufacture? I’m currently traveling, but when I get home, I’ll try to help you out. Can you send me a picture of your plane. Thanks Paul, I appreciate your offer. I’m not sure how to send the pictures to you, this comment area will not let me paste them. Please advise how to do this, I’m new on this web site. Also, I did not think my comment had posted, so I tried again and now there are two similar ones. Is there a way to delete the second one?